Since 2011, the Syrian civil war has forced more than 5 million Syrians to flee their homes and their country. According to the United Nations, more than half of all Syrian refugees—roughly 2.5 million—are under the age of 18. Most have been out of school for months, if not years. They are on the verge of being a lost generation. 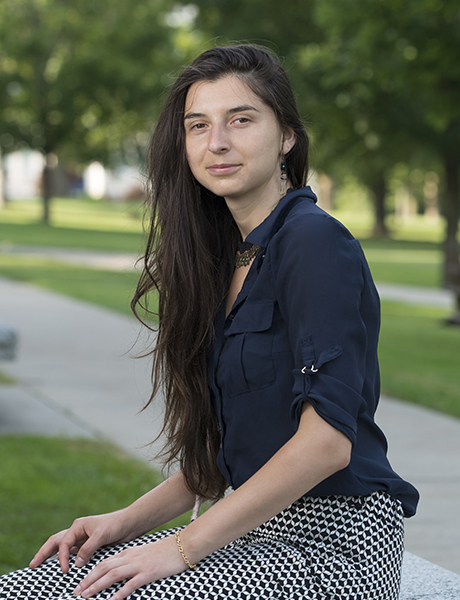 Kathryn Davis Fellow Ana-Maria Szilagyi is working on a plan to help them. Ana-Maria enrolled in school and quickly learned Italian. The summer before her senior year in high school, she found a job as a hotel housekeeper in Brighton, England. It was an opportunity to earn money, travel, and learn English. After high school, she received a full scholarship to enroll in a dual-degree program at Science Po Paris and Columbia University. In 2012, Ana-Maria moved to Paris and began college. Two years later, she moved to New York City to begin classes at Columbia. In the course of six years, Ana-Maria had lived in four countries and learned three new languages. She had encountered discrimination, worked low-paying jobs to help cover her expenses, and struggled to adapt to new cultures. Far from her home in Romania, she often felt like a refugee. But through it all, one thing kept her focused and determined: her education. "By combining practical leadership skills with intellectual clarity, I aim to help Europe and its refugees achieve the best possible reconciliation of their colliding destinies." Ana-Maria is only 24 years old. And yet she’s already developing a plan to create a nongovernmental organization that advocates for refugees, disseminates practical ideas for receiving them, and ensures the education of refugee children. She wants to establish her NGO in Germany, a country with a strong economy and a political willingness to accept refugees and integrate them into their society. More than 1 million refugees have been taken in by Germany in the last three years. “By combining practical leadership skills with intellectual clarity, I aim to help Europe and its refugees achieve the best possible reconciliation of their colliding destinies,” she says.